Sampson Low, Marston, & Co., 1893, Hardback. Condition: Good. Boards a little rubbed at extremities. Foredges dulled. Signed by the author on the ½-title page - unverified and reflected as such in the lack of premium. Slightly odd note is that the last page, following pp316 is pp137 which I assume is a printers error. Third Thousand. 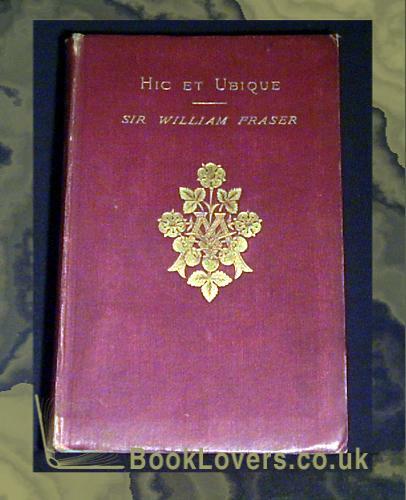 Sir William Augustus Fraser, 4th Baronet (10 February 1826 – 17 August 1898), English politician, author and collector, was born the son of Sir James Fraser, a colonel of the 7th Hussars, who had served on Wellington's staff at Waterloo. Size: 8vo Foolscap (17 x 10cm Approx.). 317 pages. Published by Sampson Low, Marston, & Co.